Grass skirts and tropical locations can mean only 1 thing – it’s Hawaiian party time. 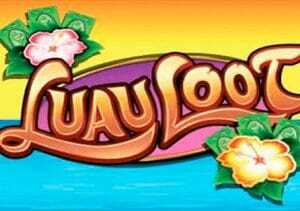 Luau Loot is a 5 reel, 25 payline video slot powered by WMS Gaming that comes with a bonus feature that awards up to 25 free spins with 2 wilds reels. Say Aloha from between 25p and £75 per spin. Set against a sun kissed, beachside backdrop, the reels in Luau Loot include lower value pineapples, guava, conch shells and coconuts. More valuable are the totems, parrots and garlands. Better still are the Hawaiian woman and the surfer, both of which award payouts of 30 times your total stake if you manage to land 5 on a payline. The most rewarding symbol by far is the Luau Loot logo which is the game’s wild – it replaces all other symbols bar the feature scatter. 5 wilds on a payline and a payout of 100 times your total bet will be surfing into the cashier. The sunlit beach scene is the key to the Free Spins feature – land 3 of these anywhere on the reels and you’ll get 5 free spins. 4 scatters and the free spins increase to 7. Land 5 and you’ll receive the full allocation of 20. On each free spin, 2 randomly chose reels will become wild to greatly increase your chances of securing a winning combination. Landing 3 or more scatters will reward you with a further 5 free spins taking your total to 25. Luau Loot is something of an online casino veteran, hitting the virtual shelves in 2012 – the blocky visuals look a little dated compared to some more recent releases. Despite the somewhat basic imagery, this slot still packs a decent punch on the features front, especially in the bonus feature where the 2 wild reels can have a big impact. This is a fairly high variance game – you can expect some lengthy dry spells but if you manage to trigger a decent amount of free spins you can soon get the party going. It may be an oldie but Luau Loot remains an entertaining and playable game. Get lucky with those wild reels and this Luau can deliver plenty of loot. If you like the theme, NetEnt’s Aloha! Cluster Pays is recommended.